Shoulder Flexibility Solution Review - Is It Effective? Knowledgeable author with tons of experience and thousands of satisfied clients. Fully comprehensive shoulder joint flexibility system – It covers not just the shoulder joint but also the neck, the spine and the core muscles to restore full strength and flexibility. Easy to follow step by step blueprint – The instructions are clearly laid out in 6 routine steps, each covering a different topic. Beneficial to most people who train in a gym or are involved in combat sports, boxing, MMA, Muay Thai, tennis, baseball and all dynamic sports involving heavy use of the shoulder joint. Prevents and helps recover from shoulder injury. Quick and effective – The routines are done in 15 minutes only, 6 days a week. Convenient Digital format – This ensures that the program is cheaper than it would be as a physical product, as no storage, delivery or inventory is necessary. It also means that it is available immediately upon purchase through a download page. 1 YEAR money back guarantee – This is the longest money back guarantee of any program we have ever come across. It’s a record and a testimony of the author’s good will, professionalism and confidence in your results. Most exercises are body weight only and can be done at home with no equipment, but few of them do require some basic tools like rubber resistance band, stability ball, a foam roller and a baseball. The Shoulder Flexibility Solution program is designed to enable you to perform your usual workouts without any trouble or pain, improving strength and flexibility, so that you can resume old exercises or routines that had become too uncomfortable or painful to perform. Here you will find what this program has to offer and how it actually works, detailing the pros and cons. The Shoulder Flexibility Solution is not just a fitness program but also an injury prevention protocol designed for anyone who wants to restore flexibility and strengthen the rotator cuff, the upper arm most complicated structure that is responsible for all your shoulder joint movements. Joint and ligament flexibility is often overlooked by people working out in the gym or training for sports innately stressful on the shoulder like boxing, MMA, Muay Thai, tennis and so on. Many times people focus on the big external, visible shoulder muscles like the deltoid and the trapezius, neglecting a very important set of smaller muscles and tendons laying below your shoulder caps that is called rotator cuff. The rotator cuff is specular to the hip joint, it connects the arm to your upper body allowing for all sorts of movements, just like the hip joint connects your leg to your body allowing for a certain range of movements. However, the shoulder joint naturally allows for a much greater range of motion, think about doing parallel dips then switching to overhead presses, that’s more than 180 degrees range. This extreme range is only possible because the shoulder joint is very open and unstable, that is the humerus head sits is a very open and loose joint bed made up by the surrounding shoulder bones like the shoulder blade in the back and the collar bone in the front. To prevent your arm, or humerus, from becoming dislodged every single time you move it, this complex system of 4 muscles and relative tendons surrounding your shoulder joint come into play. Normally, these marvelous little muscles and tendons keep your arm safely lodged within its bed, working in synchrony as you move your arm. However, given its complexity things can and do go wrong, especially when you place undue stress on your shoulder joint with repeated, strenuous movements as in combat sports, or more commonly due to poor form when performing regular exercises like over head military presses, bench presses, raises or any other movement. 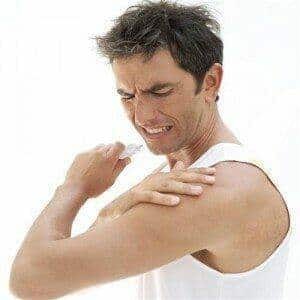 The net result is a vast array of shoulder conditions that can set you back even for months on end, things like inflammation, shoulder impingement, tendonitis, or even a frozen shoulder. This program tackles these often overlooked shoulder joint problems and promises to restore flexibility and strength as a foundation for an efficient shoulder joint that can withstand any workload from delts, pecs, lats and traps, and even claims to increase range of motion and reduce stiffness. Here is what we found. You should also read our Complete Shoulder and Hip Blueprint review. The Shoulder Flexibility Solution is a full system designed to improve not just range of motion, but real life flexibility and strength that unlocks stiff shoulders and prevents pain or injury. The System is based on 9 foundation factors, that are in turn divided into 3 different categories which give the program the 3D definition. These are: the strength factor, the neuromuscular factor and the soft tissue factor. Here is the break down. Strength Factor 1 – Joint Stabilizer – Without adequate conditioning, your body will stiffen up your shoulder joint muscles to prevent injury. Strength Factor 2 – Core – Core muscles like the abs and the back muscles are often neglected. As a consequence, other spine muscles like the psoas and glutes will tighten up to compensate. A reminder, if you needed one, that your body is a complex machine where a lagging or failing part can impact other apparently unrelated parts. Strength Factor 3 – Prime Movers – These are the muscles responsible for your strength through the full range of motion. If you neglect these muscles, you will not be able to make effective use of any increase in range of motion you may have achieved through static stretching. Neuromuscular Factor 1 – Control – This describes the development, through training, of the ability to activate or relax your muscles, as conscious, voluntary movements affects the development of strength and flexibility. Neuromuscular Factor 2 – Reflexes – This part of the program is concerned with the development of the myotatic stretch reflex and reciprocal inhibition to improve flexibility. Neuromuscular Factor 3 – Pain Tolerance – No pain, no gain. The Shoulder Flexibility Solution program is no exception. This means that in order to improve your flexibility you must expect to push progressively beyond the comfort zone. Soft Tissue Factor 1 – Muscle – Muscles must be stretched in a particular way so as to target all fibers and not just some of them. The blueprint tells you how to do just that. Soft Tissue Factor 2 – Fascia – This is the connective tissue between muscle fibers. Common ailments like adhesions and tissue scarring are addressed in the program so as to prevent them. Soft Tissue Factor 2 – Joint Capsule – An often overlooked part of the shoulder joint in the capsule, the membrane surrounding it. The program has a blueprint to prevent the formation of scarring and adhesions of the capsule which alone is responsible for up to 47% of loss of flexibility. Eric Wong claims there are 3 main reasons why static stretching does not work, each worse than the other. For a start, static stretching provides only temporary relief because it is focused just on the symptoms, not the root cause of the problem. This means that once you stop stretching, stiffness, limited flexibility, limited range and droopy shoulder will come back. This means that static stretching stays just that, static, without actually building a solid foundation that improves your dynamic movements. What this means is that is order to improve flexibility you need to go beyond the mere passive, static stretching. According to the author, you need to loosen tight muscles to improve flexibility, that is you must address strength and your neuromuscular efficiency if you want to make use of an improved range of motion. Static stretching does not do that, it can only passively and temporarily improve range of motion without building any strength. When the time comes to use your increased range of motion in an exercise or athletic movement you will simply lack the necessary strength and neuro-muscular coordination to perform it. As a result, your nervous system will kick in a sort of defense mechanism that will restrict and stiffen you up to prevent injury because you simply do not have the necessary strength and neurological control for that particular range of motion. Not only that, trying to perform increased range of motions in a workout with just passive static stretching as a foundation can be dangerous and lead to injury, which is why your nervous system automatic response is to tighten up. Ligaments are there to keep your joint stable and your limbs in place. However, what Eric Wong found in countless cases is that excessive static stretching can actually damage not just ligaments, but all the components making up the rotator cuff, like the muscles and the bursa, a protective membrane surrounding the shoulder joint. Not just gym goers, but all people practicing dynamic sports requiring constant arm swinging and hitting like combat sports or tennis that traditionally put a great stress on your shoulder joint. A strong rotator cuff and full flexibility and range of motion is what the program is all about. No matter how strong your delts or traps may be. If the shoulder joint is not up to the task, you are doomed into a self fueling circle of inflammation, stiffness, impingement and limited range of motion. Mobilize the joint – This step is the base foundation of the process. It targets the capsule because this component of the shoulder joint is a primary cause of restricted range of motion. Addresses scarring and adhesions – These are typical problems that restrict blood flow, oxygen and nutrients. The blueprint tells you how to heal the above to improve flexibility. Deactivates compensatory muscles – These are muscles that activate as a response to the weakness of the muscles they are compensating but were not supposed to be active. The protocol tells you how to deactivate them to recover from tightness. Creates strength trough the full range of motion – Full strength is necessary to prevent the neuromuscular system from stiffening up your shoulder as a response to “perceived” weakness. Stabilizes the range of motion by strengthening all the muscles involved in the motion. Functional Integration – Once you have gained strength and range of motion, the system tells you how to integrate them in specific movements so as to become hardwired into your nervous system. Shoulder Flexibility Solution is the creation of Eric Wong, a strength and conditioning coach to combat athletes and a personal trainer to thousands of customers thanks to his online programs. Crucially, he devised his program not just by putting in his own expertise but also by responding to his customers’ needs, listening to their most common complaints and trying to find a solution for them. He found that the most common issues afflicting his clients involved the rotator cuff, the inability or impairment to perform over head presses, slouching posture, rounded shoulders, excessively curved spine, impingement, neck pain and lack of range of motion, like the inability to touch both hands behind their back. He noticed that the typical run-of-the-mill remedy for these issues was static stretching, but the author found this method to be ineffective. There are 6 practical routines in the program to achieve what it says it does. Each routine comes in PDF format with all the exercises, reps, sets and rest periods and lasts 15 minutes, 6 days a week. Eric Wong also added a downloadable video library where he shows how to implement every exercise, very useful for correct execution and to avoid injury. Behind The Back Routine – This is a very simple but tell-tale sign of poor shoulder flexibility. If you cannot touch your hands behind your back, you have a problem. The routine addresses this problem by making your shoulder tissue supple enough to touch your hands again. Forward Head Posture Routine – According to the author, for every inch forward you add an extra 10 pounds of stress on your spine, leading to neck pain. The routine is designed to revert to a neutral head position, removing stress from your neck. Overhead Routine – This routine is designed specifically to improve overhead movements and range through exercises targeting not just your shoulder joint but also your thoracic spine. Rounded Shoulder Routine – This routine is aimed more at posture than range of motion. The author felt necessary to target this particular problem as many people seem to be affected by it because of the modern, sedentary life style. A slouched posture can also lead to degeneration of the disks. Winged Scapula Routine – This routine targets the serratus anterior and subscapularis to fix an unstable shoulder blade, which can lead to diminished strength and injury. Pre-Workout Warm Up Routine – This routine activates all of your shoulder stabilizing muscles to ensure that your shoulder is safe during the workouts. It allows you to lift more weight with less effort and most importantly safely. You also get an Implementation Guide with the program. This guide is set up for you to assess your personal level of shoulder fitness. Based on the results, you are then told which routines to do and which ones to avoid to ensure you get the most benefits. The Shoulder Flexibility Solution could be considered a full system that tackles all aspects of the shoulder joint. It is not restricted to just the shoulder but it includes also other body parts involved in shoulder problems like your neck, spine and core muscles in order to deliver a fully comprehensive system designed to restore flexibility, strength and full range of motion. The format is convenient and easy to follow, it can be customized to your personal shoulder fitness level through an initial assessment and is a necessary tool for all those involved in resistance workouts or dynamic sports in order to prevent shoulder stiffness and limited range of motion or recover from it.